Mahindra has moved from obscurity in the local market to being a real player in the automotive industry. Over the past 10 years, the brand has evolved from "bargain-hunter" status to be able to take on more established automakers with competitive offerings. It's the latest model, the XUV300, launched in sunny Goa, India, that raises the bar that much higher for future Mahindra products, as it’s simply a surprisingly good compact SUV offering. Locally, the new SUV will be available, says Mahindra SA, in three variants. They will be mechanically the same and most likely the same nomenclature as other Mahindra products (W8, W6 and W8). Durability testing for South Africa began in November 2018 and is set to conclude later this month. The arrival of the XUV300 is set for Q1 (possibly April) 2019 with SA-specifications and details to be revealed closer to the local launch. And the price? Well, Mahindra says "pricing to be confirmed but will be aggressive". What's it like to drive? The XUV300 makes for a pleasantly surprising experience behind the wheel. Driving in India is an eye-opening experience; it's amazing the perspective you gain when a two-lane road suddenly serves six vehicles abreast, all vying for the right of way. Curiously, it seems to work for Indian motorists, as they're simply driving the way high school learners would navigate a school hallway: Jockey for position, shove ahead and hope for the best. In an environment where lanes are ignored, indicators rarely used, and obeying the rules of the road optional, you'll need a vehicle that's capable of handling any task. If the XUV300 can deal with India's bizarre, claustrophobic and chaotic road network, it should be able to handle South African routes with ease. Its engines, especially the diesel, are incredibly refined, making powertrains featured in rival products (read: EcoSport and Creta) seem ancient by comparison. The XUV300 can be powered with a choice of 1.2-litre petrol and a 1.5-litre diesel. The diesel proved to be yet another pleasant surprise as, the moment your foot steps on the throttle, you're greeted to a swell of torque, handy when you require power during city driving. Its 6-speed gearbox works very well. The torque does taper off toward the top-end but, according to Mahindra, that is not where the engine revs need to be (read: taking gaps in chaotic Indian traffic). There's plenty of power available for sudden overtaking within a city. The ride quality is excellent, and the engines smooth and steering effortless though lacking in feedback. The clutch is light, a boon considering its family-orientated target market, and gearshifts are surprisingly smooth and effortless. 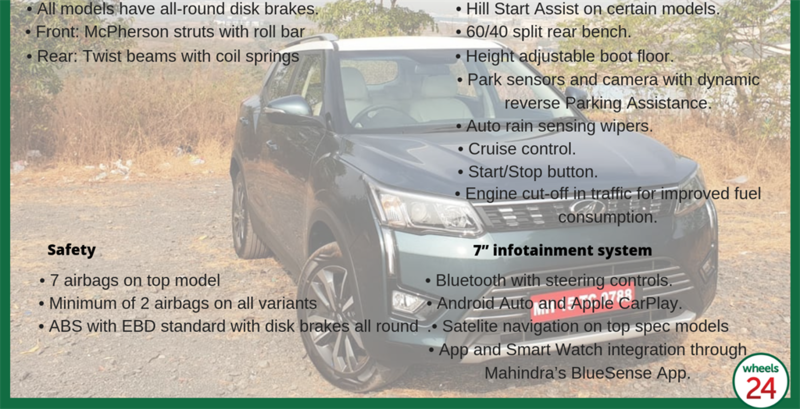 I've used the word "surprising" before and, if you've ever driven a first-generation Mahindra product, you'll understand what I mean as, overall, the XUV300 is a very agile, easy car to drive, perfect for "urbanites" who participate in the occasional weekend road trip and a vast improvement over its previous products. The XUV300's ride quality is excellent and able to soak up bumps and undulations with ease, and handle corners at brisk(ish) pace. It delivers a pliant ride, soaking up nasty road imperfections, such as potholes, courtesy of good suspension and 180mm ride-height. There's little to no wallow in corners and negligible body roll, with sufficient grip provided you don't push it too hard. The engine doesn't feature drive modes but curiously the steering does, an option relatively absent in its segment. Drivers can switch to Comfort mode to keep steering light and breezy, while Sport provides some heft to the steering wheel though, sadly, there's no real feedback. For Mahindra to truly assert its XUV300 as a true player in the market it needs to launch an auto variant. No, not a clunky CVT, or heaven forbid an AMT, but a proper auto transmission into the local segment. Mahindra confirms an auto is in the works but has yet to release details. The new SUV isn't without its faults – steering feedback is lacklustre, there's currently no auto, and the boot could've been bigger given the vehicle's size. In its primary respects, however (performance, space and drivability), Mahindra's engineers have done an excellent job. A quick word on design: The XUV300 is not bad on the eye and, in terms of design, has a lot going for it. Mahindra has learned from its previous offerings and delivered a product that sports contemporary styling throughout, especially the interior. Inside, the fit and finishes are very good, with a few quality elements, particularly the dashboard, centre console, and its overall smartphone/smartwatch connectivity. It's on par with others in the compact SUV market. 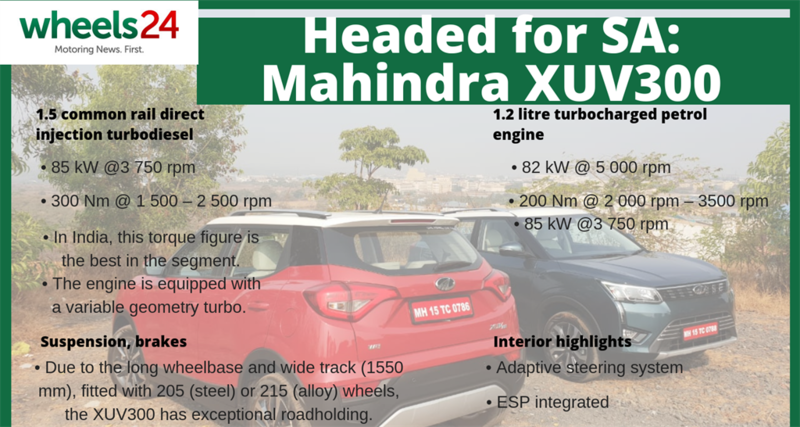 Mahindra has set to sights on Ford's EcoSport, a major rival for the XUV300 in its home market and a major contender in South Africa. The XUV500 is agile, delivers adequate performance and is quite practical for its size. If nothing else, it's a good SUV that serves as a benchmark for future products from the Indian automaker. What remains to be seen is how it will fare against a host for well-established players in the mid-size SUV segment. The XUV300 has the potential to be a bestseller. What remains now is for Mahindra to deliver on pricing; if priced closer (or more affordable) than the EcoSport, its performance and features should make it a triumph for the automaker. Ultimately, Mahindra has developed a good product and, like its marketing slogan, is on the rise in every automotive sense.